Fantastic place for peaceful break. 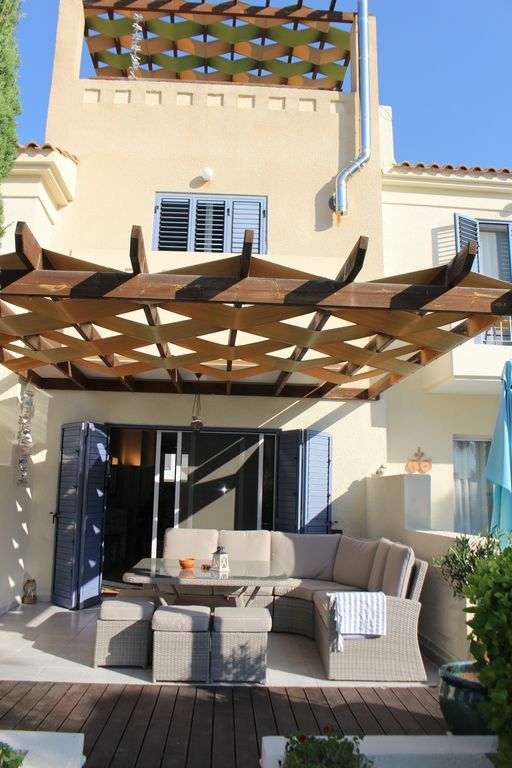 Fantastic house on small exclusive complex in lower Peyia. Approx 1 mile from Coral Bay & beaches & restaurants and around half a mile from Peyia village with shops, bars and restaurants. The perfect base to explore the rich diversity of the Cypriot west coast. 10k from paphos with the Unesco heritage site, museums and Roman remains, and just down the road from the sea caves & beautiful secluded beaches. Information on the surrounding area is widely available - the following description & pictures focuses on the rental property and the facilities provided. Situated in a small exclusive complex of around 25 properties with a communal pool situated in beautiful gardens. The complex is very well maintained with an intimate & convivial atmosphere that will suit holiday makers who enjoy the quiet tasteful tranquility on offer. Ground floor with open plan kitchen area, dining area, lounge area with bed settee and outside patio area with rattan furniture and ajacent to the communal gardens & pool area. 2nd floor with double master bedroom, 2nd twin bedroom & bathroom. 3rd floor roof garden / sun terrace with seated area on one side and jucuzzi on other. Perfect place to watch sunset over Coral bay and soak up the sun. The property is well appointed and comes with full air conditioning, WIFI, washing machine, dishwasher, 2 fridges & wall-mounted TV, as well as a jucuzzi. Also allocated undercover parking. There are shops, bars and restaraunts in walking distance, however a car is recommended as most of time it's so hot to walk and there are are so many beautiful villages and beaches to visit nearby. John & Helen bought this property after falling In love with the house, the complex and the area. The plan is that in a few years, when we retire we will live there for most of the year. Meanwhile we'll be visiting for holidays, with the property available for holiday rentals. Fantastic complex with beautiful gardens. Loads of space - 105 sq meters to be exact. Great location - only a mile from coral bay beaches and Peyia centre with many bars & restaraunts less than a mile in other direction. Spectacular roof terrace with sun terrace & jacuzzi overlooking gardens with sea views. Very well appointed - most of furniture is new and includes wifi, Large TV, washing machine & dishwasher, iron & board, hair dryer. Travel cot and high chair available Also allocated under-cover parking spot next to front door. A welcome pack is provided on arrival. The roof top with hot tub is amazing. A lovely location with great facilities. The house was very comfortable and the use of the pool and hot tub were great. We have never stayed in a holiday home as nice as this before! We arrived and it was perfectly clean and looked lovely. We were also very impressed with the facilities, John had even made sure that highchair and cot were set up, ready to be used for our little one. Everything we needed was there and we truly enjoyed getting into the jacuzzi in the evenings after a long day. We stayed here for 2 weeks in July and it was amazing! It’s around half an hour from Paphos airport, it’s best to get a car to get around but they drive on the same side of the road as the UK! It’s so peaceful at Irini gardens with a beautiful clean pool. It has everything you need including BBQ for outdoor lunches on the terrace and a hot tub on the roof! It’s in a great location away from really touristy noisy area, but only a 10 min drive if you wish to visit. The beach is 5 mins away. Amazing relaxing place, we have booked again for this year! We were looking for a quiet, relaxing holiday in the Paphos area and found it at Irini Gardens. The house was spacious and modern with mostly new furniture, including a gorgeous outdoor patio area with a sofa and table. We loved this spot and spent many hours sitting here relaxing, enjoying the beautiful gardens. The pool and sunbeds were immaculate and well kept. The house is very well equipped with everything you could need, including towels, cool bag and umbrella for days out on the beach. The jacuzzi on the roof top was a lovely spot to watch the sun go down. This was a perfect holiday and a few small touches like the food welcome pack just made it a little more special. John, the owner, was a pleasure to deal with throughout the rental process.